FusionStorm assists organizations by providing complete solutions for system infrastructure, storage, networking, voice-over-IP communications, security, database, disaster recovery, managed hosting, cloud computing and managed services, both onsite and in FusionStorm data centers. 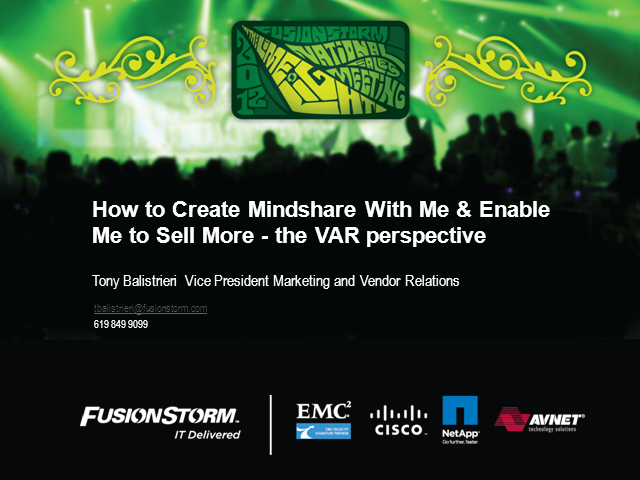 With a strong portfolio of technology partners, Tony and his teams are bombarded by initiatives designed to help FusionStorm be a better marketer and sales person of 'insert vendor name' solutions. Tune in to hear what Tony thinks is working and where there are disconnects with actionable recommendations on how you can increase his mindshare, truly enable him to sell more and win his loyalty.